Russian defense contractors are making record profits despite the ongoing conflict in Ukraine and the pressure of Western sanctions, Defense News reports. “Russian defense firms featured in this year’s Defense News Top 100 ranking saw surging revenues as exports reached new highs and the government poured money into defense procurement,” the article notes. One company, the Tactical Missile Corporation JSC, saw a 48.6 percent rise in its annual revenue to $2.8 billion. The country’s largest producer of air defense systems, Almaz-Antey, increased its revenue by ten percent to $9.2 billion, up $882.5 million in comparison to 2013. Other Russian firms that fared well: “the United Aircraft Corp., which owns Sukhoi, MiG and Irkut, and saw revenues rise 7 percent to $6.2 billion; Russian Helicopters, which finished at $3.96 billion, up 16 percent over 2013; and the United Engine-building Company, which saw a 25 percent increase over 2013 revenues to $3.3 billion in 2014,” according to Defense News. Interestingly, the world’s largest main battle tank manufacturer, UralVagonZavod (UVZ), reported only a one percent revenue increase in 2014. However, this is likely to change soon, since UVZ will begin mass-producing the T-14 Armata main battle tank in 2017 with the goal of producing a total of 2,300 T-14 models by 2020 at a cost of $8 million per unit (See: “Is the World’s Deadliest Tank Bankrupting Russia?”). There was no data available on Russia’s military shipbuilding industry. One explanation for the boom in Russia’s defense industry is strong exports–$13.2 billion worth of military hardware was sold abroad in 2014. Russia’s arms export markets are primarily non-Western (Algeria, China, India, and Venezuela etc.) and consequently the Western-imposed economic sanctions did not affect business. The second explanation is domestic spending. Back in 2010, President Vladimir Putin launched a massive 20 trillion ruble (roughly $330 billion) military modernization project that aims to replace 70 percent of Soviet-era military hardware by 2020, including 50 new warships for the navy, hundreds of new fighter jets, and thousands of new vehicles for the ground forces. 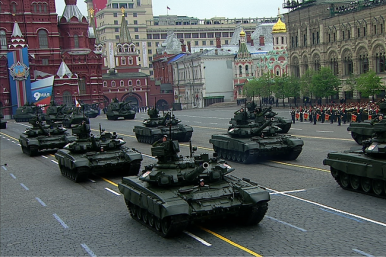 In addition, Western-imposed sanctions will disrupt supply chains of Russian defense contractors, since not all components of weapon systems can be indigenously produced (See: ”Is Russia’s Deadliest Tank Using Western Technology?”). This is most acutely felt in Russia’s shipbuilding industry. As I reported before (See: “How the Ukraine Crisis Interrupts Putin’s Naval Dreams”), the Russian surface fleet is particularly affected by the sanctions since some of its newest surface ship classes—the Admiral Grigorovich-class (Project 11356) and Admiral Gorshkov-class (Project 22350) guided missile frigates—require Ukraine-made gas turbine engines. Vladimir Putin, however, will in all likelihood press on with his modernization program, as I explained in another article.